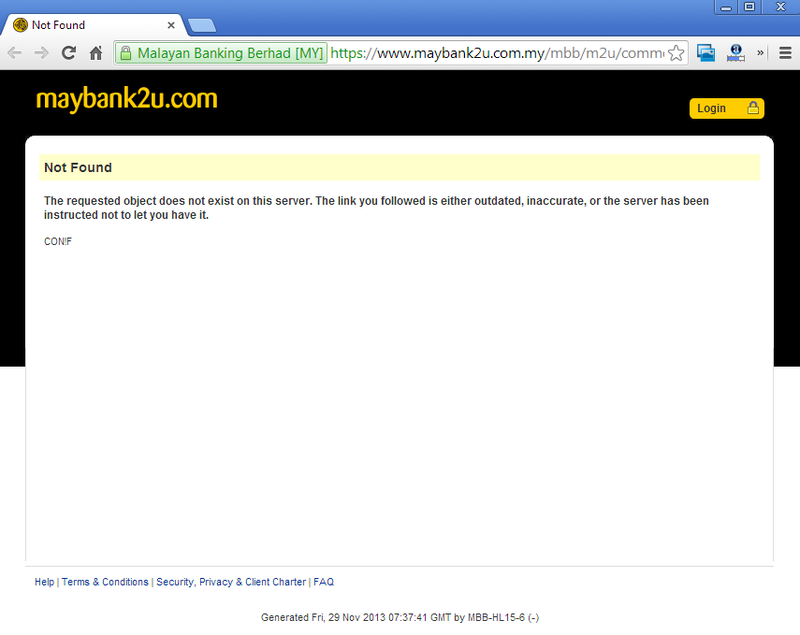 Did Maybank2u crash the Black Friday party? On 29 November, Maybank has launched its revamped Maybank2u site which probably takes inspirations from Windows 8 tiles layout. Maybank acknowledged the site "slowness" on its Twitter account, in response to a Twitter user who questioned Maybank on rolling out major revamp on the last banking day of the month. This has been confirmed by iPay88 on their Facebook page as Maybank2u has been temporarily disabled since 2pm until further notice. 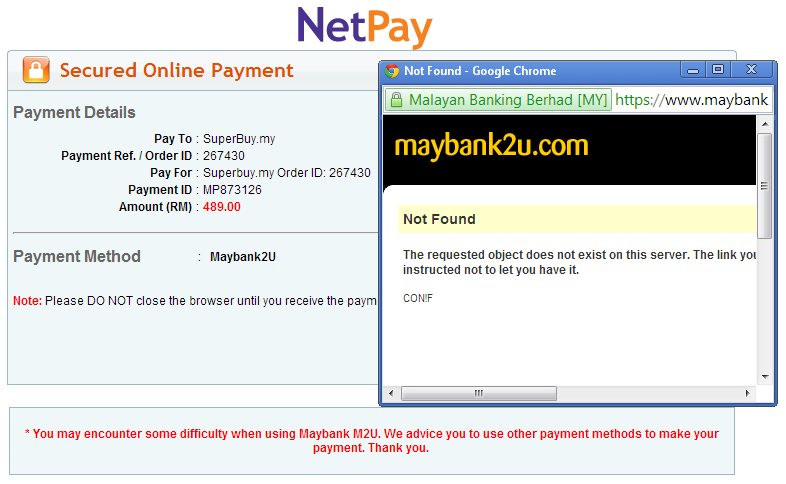 MOLPay on another hand published the Maybank2u payment successful rate that dipped to as low as 10% on 29 November. There are 2.3 million active Maybank2u users (in 2012) which represent 50% of total online banking users here. According to an infographic released by MOLPay (in 2013), 20.5% of online transactions in Malaysia are using Maybank2u, with CIMB Clicks and FPX both at 8.4% respectively. Obviously being such a popular payment method, any downtime or instability of Maybank2u will severely impact e-commerce websites and online shopping experience. Lelong.my Black Friday Sale has been turned into...... "Blackout Friday"
Coincidentally, Lelong.my is launching its inaugural Black Friday Sale together with its sister sites like Superbuy and GroupMe, on the same day with Maybank's website revamp on 29 November. Lelong.my has even invested on newspaper full-page ads for the first time ever (you can check the ads here), not to mention the amount of effort required to prepare for this campaign. It is such an unfortunate event that with so much investment in terms of resources and marketing dollars, online payment facilities are failing them on their big day. On that Black Friday day itself, we are following up closely with the Director of Lelong.my, Mr Wei on their challenges and troubles. 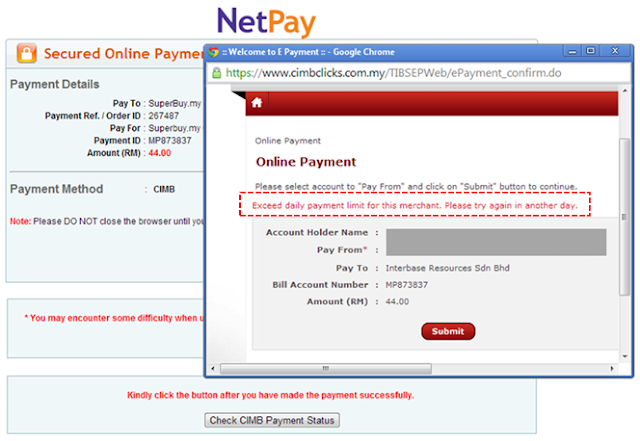 Mr Wei has shared with us that they are trying to encourage their customers to pay using CIMB Clicks (2nd most popular online banking here) after facing the Maybank2u issue. 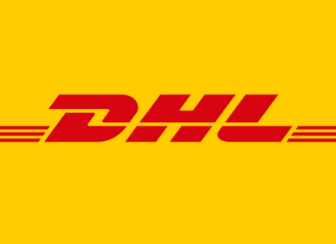 Exceed daily payment limit for this merchant (Lelong.my). Please try again in another day. According to our findings, CIMB set a daily payment limit for B2C transactions at RM 30,000 while B2B transactions is capped at RM 1 million. We wonder if CIMB inform merchants about this, or any of you reading this are aware of the daily transaction cap. Being failed by both Maybank and CIMB, Lelong.my has published a notification message on their website saying that "It's really a Blackout Friday for us". On the same day itself, Groupon Malaysia has also posted on its Facebook Page announcing the difficulties of Maybank2u. The fiasco is finally over as the old design has been restored to ironically replace the new look site, on midnight of 30 November as reported by LiewCF. 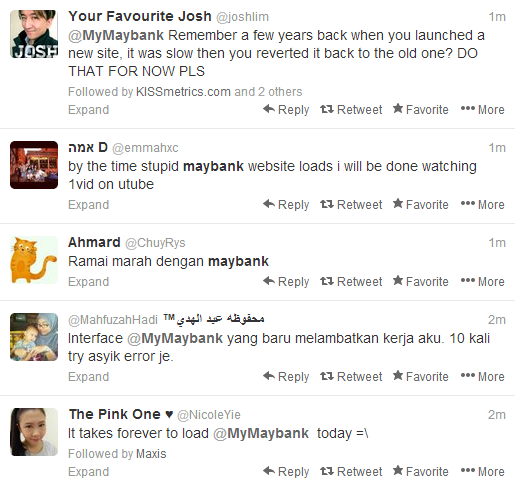 Maybank has also apologized on its website and Twitter on 30 November. Obviously this is a major hiccup by the largest bank in Malaysia, and many are questioning the roll-out of a major revamp while it is not ready and tested. The counter measure was also slow as it took so many hours for Maybank to restored the previous design and probably system or infrastructure. This is the first time we witness in Malaysia that big e-commerce sites are launching Black Friday and Cyber Monday campaigns which we can expect online shopping and transactions to peak on certain days. How are we supposed to do business when Maybank2u is down at the month-end peak period, during when we expect online sales to spike? Marketing spending is wasted as our customer couldn't make online payment. Perhaps Bank Negara Malaysia need to have a guideline in place to monitor and control online banking downtime. As you can see, many e-commerce sites are putting in big effort and marketing dollars to encourage online shopping. The merchants are ready, the customers are getting ready, but our financial infrastructure is not ready yet if we look at this incident on 29 November. Without a stable and efficient online banking infrastructure, how does ICT and specifically e-commerce supposed to be a catalyst for the nation's growth? ecInsider: Did Maybank2u crash the Black Friday party?